I was anxious to return to our cabin and check on Gertie and the duck since my husband and I had left them on their own. I especially missed Gertie, the orphaned gosling we’d raised. Get a grip, I told myself. 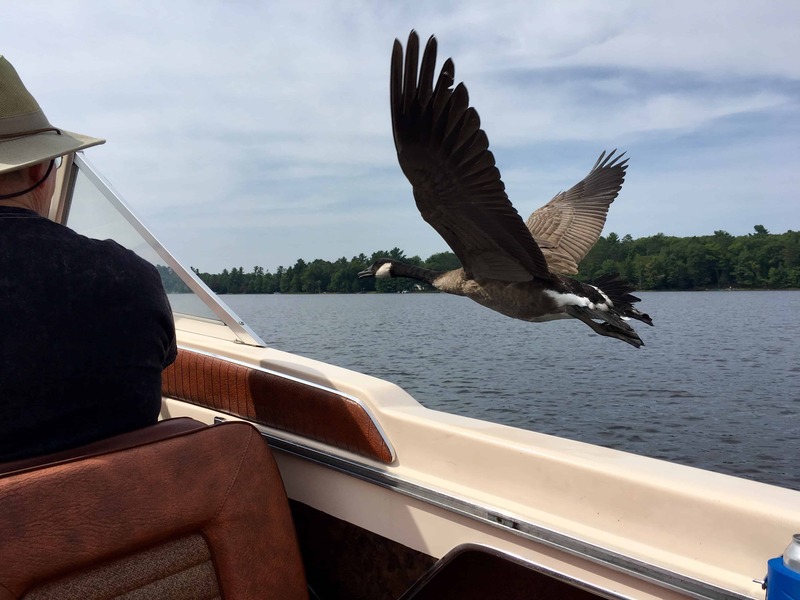 Gertie is only a goose, one of the thousands we Wisconsinites hear honking and watch flying in their classic V-formation. But after arriving at our cabin, I hurried to look for her and Doc. My husband followed. Our feathered friends weren’t by our shore. I called, but no answer. We took the speed boat out and found them in a nearby bay. They swam right up to us. Doc had an injured foot which we guessed was from a snapping turtle, musky, or one of the weasels or mink we sometimes spotted near our shoreline. Gertie and Doc happily followed us back to the cabin and hung out with us anytime we were outside. Doc did her best to keep up with Gertie, but she was much slower. When Frank checked on them at 10:30 that night, he saw only Gertie’s silhouette on the water. In the morning, Doc wasn’t alongside Gertie. Sadly, I investigated and found feathers nearby. It was very difficult to deal with guilt feelings wondering if I should have taken her to the vet for her injured leg or penned her up for the night. Gertie, who had always wanted to be with us, was more clingy than ever. She’d lost her friend and seemed to want to tell me all about it. That evening, when she hung out near our back door instead of near the lake, we decided to let her spend the night in the garage. Gertie continued to want to be with us. We were her flock. One afternoon when we took the grandsons for a boat ride, she swam along. Previously she’d only flown in short bursts, but this time, when Frank revved the motor and sped away, she lifted off. She flew behind us for several seconds, then caught up and flew alongside us. “See what I can do!” she seemed to say. We cheered. Our grandsons giggled. Encouraged by our excitement, Gertie showed off even more and flew over our heads, honking all the while. At one point, she took her turn at lead position and flew just ahead of the bow. We formed a perfect V.
Over the course of the next several days, we “flew” with Gertie several more times. It never ceased to thrill us, or, I believe, her. She stretched her neck so her head was close to mine. She gave me the contented wiggle- wiggle-wiggle coo that I’d come to love. My eyes stung. She’s only a goose, I kept reminding myself. The next day, after we’d set her down in the middle of a flock of geese at the zoo, I couldn’t stop the tears. I kept repeating only a goose, only a goose, but it didn’t help. My heart ached. Walking away and leaving her was unbelievably difficult. “I’ll keep my eye on her,” the zookeeper said gently. We did go back. I feared that we’d find a lone goose walking the sidewalk looking for a human companion, but happily, that wasn’t the case. Even though we visited all three ponds populated with geese and ducks and called her name, she didn’t come. She’d joined her kind and was living the good life. Sharing time with Gertie, especially our moments of flying together, will live in my memory as one of the most amazing experiences of my life. God speed, my feathered friend.